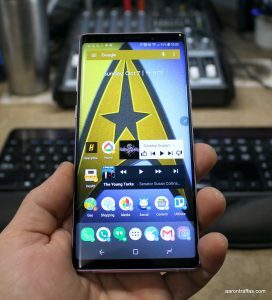 For the last three weeks, I’ve been evaluating the Samsung Galaxy Note9 from my friends over at Verizon. I’ve found a monster phone with pretty much every conceivable feature that can be crammed into a modern device. 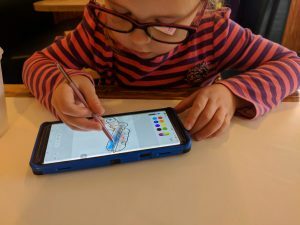 While I can always pick nits and find a few things I wish had been done differently, at the end of the day I could reasonably make the case that the Note9 is the most robust and useful smartphone currently on the market. The best thing about the Note9 isn’t really one thing, it’s that it ticks all the boxes. Wireless charging, headphone jack, long battery life, stylus, great cameras — it’s tough to find a feature that the Note9 isn’t packing. The integration of Samsung’s assistant Bixby is disappointing. It might be valuable to someone who doesn’t want to use the Google Assistant, but I have yet to meet someone who would pick Bixby over Google Assistant. In any case, this is a pretty small inconvenience on an otherwise outstanding device. The first thing I noticed when I picked up the Note9 is how large and solid it feels. With a 6.4″ screen, it’s one of the largest phones I’ve ever used, but it’s not clunky. The specs are all top-of-the-line, too, which means never waiting on apps to load and plenty of space for all my photos and podcasts. 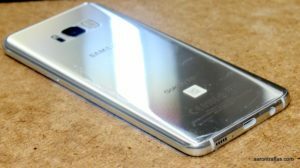 The S8 and Note8 suffered from horrible placement of the fingerprint sensor. 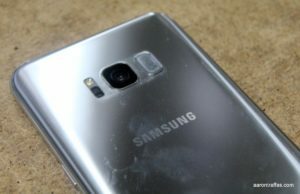 The sensor in the Note9 is placed under the rear camera. While it’s a little higher on the device than feels comfortable to me, it’s much better than last year’s devices. While barely heavier than last year’s Note8, the capacity of the Note9’s battery is more than 20% larger. The larger battery and the improvements in Android 8 actually make it so that I can use this phone without needing an external battery. It’s a marked difference from the LG V20, my current daily driver, which needs a 10000 mAh hour battery just to get me through the day. The Note9 would consistently last me past 5 p.m. and often past 8 p.m.
I’m a sucker for wireless charging. Not only does the Note9 have wireless charging but it works really well. Even through my case, the phone charged wirelessly from roughly dead to full in under 4 hours. Like the last several Samsung phones, the edges of the Note9 are curved. This disastrous design decision means that it’s harder to install good screen protectors. I ordered and installed a tempered glass screen protector and quickly found that the touch sensitivity had diminished substantially. I only recently learned that there’s a software setting that compensates for this issue and now wish I’d have found it sooner! The S Pen on the Note9 has the same great accuracy and sensitivity as previous Notes, but this stylus has a Bluetooth button which can serve as a remote for the camera, presentations and audio playback. The Note9 has two cameras on the rear and one on the front. The rear cameras are standard and telephoto. I’ve always preferred LG’s approach of including a wide-angle option instead of the telephoto, but I found plenty of instances where I appreciated having the ability to zoom. As with all Samsung flagship phones for as long as I can remember, the camera quality is outstanding and the software is crammed with features. I’ll have a picture gallery of unedited photos at the end as always, but I really enjoyed the slow motion video function at the Kansas State Fair and at Leonardo’s Children’s Museum in Enid, Oklahoma. Here’s a compilation video of some slow motion captures. The one issue I had when I was taking a bunch of videos at the fair was that the phone overheated. It simply got too hot and told me it wouldn’t run the camera until it cooled down. Another camera aspect worth mentioning is low light performance. Shots taken at night with the Note9 were substantially better than those taken with my LG V20, as shown in this comparison. It wasn’t long ago that Samsung’s software was terrible. While they continue to include some superfluous apps, they’re easy to remove or disable. 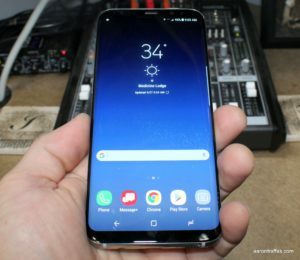 After replacing the launcher with Action Launcher and the keyboard with Gboard, what’s left are Samsung’s enhancements that support the stylus and camera or are actually useful features like the touch sensitivity setting, the built-in battery optimization and the biometrics features. The exception is Bixby, Samsung’s assistant that coexists with the Google Assistant on the phone. There’s a dedicated button below the volume keys to launch Bixby. Because I’m all-in with the Google Assistant, Bixby isn’t something that interests me and I found the extra button annoying whenever I accidentally launched Bixby. Honestly, there are so many features tucked into the Note9 that it’s extremely versatile. 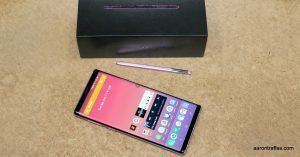 The Note9 is the perfect phone for a power business user who wants the best in security and carries a cable to plug the phone into a projector and use the S Pen as a presentation remote. It’s a great phone for a soccer mom who wants a big and bright display on a stylish phone that has outstanding cameras. It’s an excellent choice for a farmer who doesn’t have time to wait on apps to load, the luxury of plugging the phone into a charger during the day or the desire to worry about running out of space for podcasts. Anyone looking for the most powerful and versatile phone on the most reliable network can’t go wrong selecting the Samsung Galaxy Note9 on Verizon. 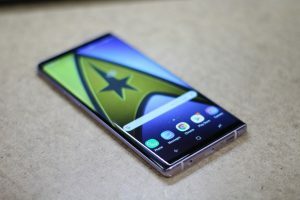 While I’ll miss the Note9 when I have to ship it back, there’s a solid chance I’ll be purchasing one as my next phone. As always, these are unedited photos straight from the camera. LG makes great phones. I named the LG G3 the best phone for the farm several months after release in 2014. When Verizon let me review the LG G5, I ordered one for my wife before I was done with my review because of the wide-angle camera. I named the LG V20 Verizon’s best phone of 2016 and promptly bought one as my daily driver earlier this year over the Pixel XL because of the enormous feature set on the V20. I was really impressed with the LG G6 released earlier this year, which was very underrated and overshadowed by the Galaxy S8, even though I felt the G6 was clearly the better device. 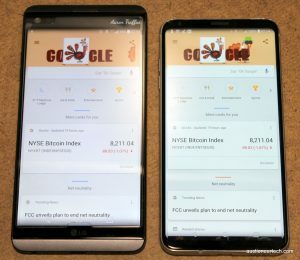 Yesterday I published my full LG V30 review on AuctioneerTech. I’ve had some questions from other fans of the V20 about upgrading to the V30, so here’s an comparison of both devices and what I think about the feature changes. 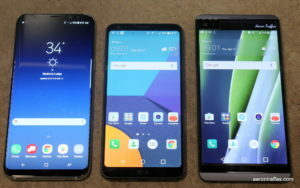 The V30 is smaller than the V20 yet has a bigger and taller screen. They both have the same 4 GB of memory and 64 GB of storage with an SD card slot. The V30 has a much faster and more efficient processor than the V20, but I’ve never noticed any problems with the speed of the V20 so for now the difference in speed is measurable but not noticeable. The screen is the most substantive difference between the two generations of the V-series. One of the selling points for the V20 is a second screen above the main screen. Technically, it’s a portion of the main display that can be lit independently, allowing it to stay on all the time without draining the battery as much as keeping the entire screen lit. 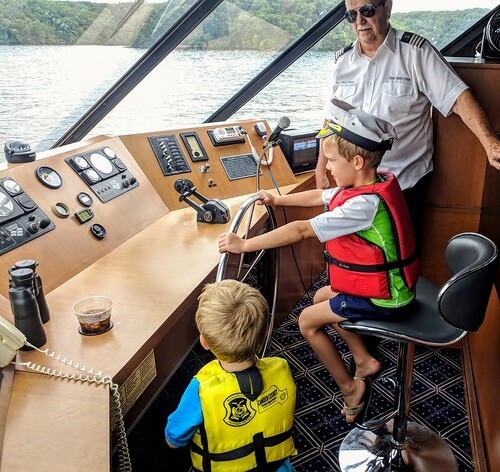 While the screen is on, it can be used for various functions – most importantly providing a place for notifications so they don’t take up space on the main screen. The second screen is gone on the V30. Instead of the beautiful 5.7″ IPS screen, LG is using a 6″ OLED panel with curved glass. Curved edges generally frustrate me because they make the phone harder to hold and tempered glass screen protectors harder to install. Cases can’t fully grip the phone, instead getting to wrap around on the top and bottom of the phone. I’m really disappointed in the changes to the screen from the V20 to the V30. Both phones have three cameras. Each has a 16 megapixel primary rear-facing lens as well as a secondary, wide-angle lens. The V30’s primary lens is slightly better than the V20’s, but the 13 MP wide-angle lens on the V30 is significantly better than the V20’s 8MP sensor. Each phone has a front-facing wide-angle camera. There’s no question the pictures taken with the V30 are noticeably better and more vivid than the V20. Also, after using the V20 for nearly a year, I experience what can be hair-pullingly frustrating lag from when I launch the camera until I can actually take a picture. I didn’t notice any lag on the V30, but I also didn’t notice any lag in my initial review of the V20. Battery life on the V20 with the stock battery is atrocious. The Geekbench 4 benchmark yielded a score of 2003 at 3 hours and 23 minutes for the V20. 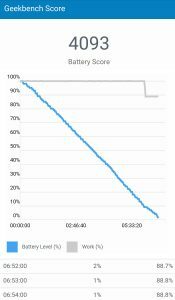 The V30 battery was more than twice as good as the V20, scoring 4260 at 7 hours and 6 minutes. The V30 also features wireless charging, a feature which was sorely missing on the V20. 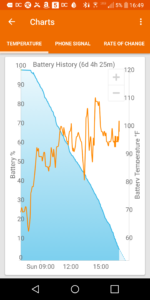 For me, the V20 is unusable with the stock battery, so I use the ZeroLemon 10,000 mAh extended battery which lasts me at least 18 hours with Bluetooth, GPS and hotspot running the whole time. I can’t award a winner here because even though the V30 battery is so much better than the stock V20 battery, the V20 allows replacement and extended batteries. I live less than a mile from a Verizon tower, but my farm is on the edge of Verizon coverage. Differences in phone antennas and the resulting reception variability is very noticeable to me. The V20 with the ZeroLemon battery didn’t seem to perform as well as the V30, which seemed to do as well as any other device I’ve tested. However, I’ve anecdotally noticed the reception with the big battery to be slightly poorer than with the stock battery, so there’s a chance that that difference in radio between the V20 and V30 might be due to the battery on the V20. The V-series is known for audio abilities. The Quad DAC that debuted on the V20 that made it sound so good with wired headphones has been improved on the V30. The V30 offers sound presets and filters, making it more customizable than the DAC on the V20. However, without the customizations, I didn’t notice much difference in the audio output between the two phones. I think this is because the V20 is already really good and it’s tough to make anything significantly better enough to notice. The V30 wins because of customizations, not because I could tell much of a difference in output without using a preset or filter. Currently, the V20 runs Android 7.0 and the V30 runs 7.1.2. While the V30 has a few extra tweaks surrounding the functionality of the curved edges of the screen, I didn’t find any software differences worth using much less mentioning. Replacing the launcher and keyboard yielded a day-to-day software experience for me that was indistinguishable from one phone to the other. From a longevity perspective, it’s worth noting that the V30 is a year newer and, thus, will likely receive longer support. To be clear, the V30 is an excellent device and improves on the V20 in a number of ways: better processor, better audio, better software, better cameras and better radio performance. When I bought my V20, I was deciding between it and the Google Pixel XL. I chose the V20 over the Pixel because of the expandable battery and second screen. Both of those features are absent in the V30. 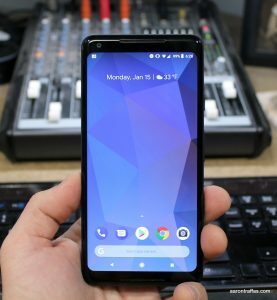 I also strongly prefer a phone with a flat screen, which the V30 lacks. Buying a phone is a very personal decision. If you’re looking for the best hardware and software in a beautiful device, the V30 is a great choice, currently $840 at Verizon. If you like a phone with a flat screen and the most features, the V20 is still an excellent deal. The LG V20 is currently $576 at Verizon. Most people these days prefer the functionality offered by modern smartphones. However, according to a 2016 survey by Pew Research Center, 18% of Americans have phones that aren’t smartphones. This group, either by necessity or preference, needs phones other than those that get the big headlines and price tags. 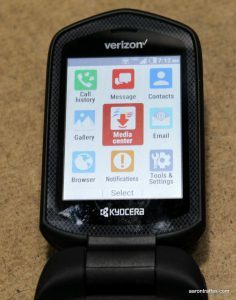 My friends at Verizon recently let me spend a few weeks with the Kyocera DuraXV LTE, a flip phone that’s both rugged and modern. I remember fondly the days before smartphones, from my first mobile phone, called a “candybar”, through the glory days of the flip phones. From 2000 through 2009, I carried a variety of flip phones from the Nokia 282 to the extremely popular Motorola StarTAC to my favorite flip phone of all, the Motorola Krzr. Flip phones excelled at being phones, providing voice quality that I have yet to see in smartphones. They also, for a Star Trek fan like me, have always seemed somehow more satisfying and futuristic than a phone that doesn’t change shape. The DuraXV LTE packs as much functionality as possible into a device without a dedicated keyboard. It has the ability to work as a mobile hotspot for other devices, working on Verizon’s LTE network. The phone feels solid in the hand yet not heavy. It’s waterproof and dust proof. Bluetooth connectivity and an SD card option make it quite functional as a media player. 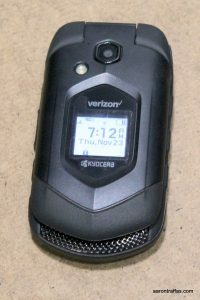 The DuraXV’s camera is a 5 megapixel shooter, though Verizon also sells a version of the phone without a camera for sensitive workplaces or children who aren’t allowed to have a phone with a camera. It’s quick and easy to use, and while it’s not anything like a smartphone camera, it takes decent pictures and video that are easy to share. Outdoor pictures in sunlight are really good. Indoor and lower light pictures are more of a challenge. 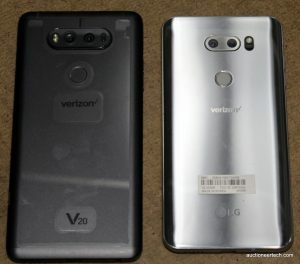 There are more media examples at the end of this article, but here’s a comparison of some pictures from the DuraXV with the LG V20. The user interface is exactly what I remember from the last flip phones I used, but the functionality is much better. Of course it handles text messages and email, but you can also play music and videos and even browse the web. The web browser is actually fairly full featured, with tabs, zoom and even a cursor controlled by the direction pad. Voice call quality is outstanding, and I would expect nothing less from a Verizon flip phone. It’s also plenty loud, which is a rare quality in phones these days. I’d forgotten how good the battery life is on flip phones. The DuraXV LTE lasts for days on a single charge, unlike most smartphones that must be charged at least once a day. Granted, battery life will vary with talk time, but unless you spend hours on the phone each day or run the hotspot for long stretches of time, the DuraXV LTE will easily last a few days before needing charged. There are several scenarios in which a flip phone is right for you. 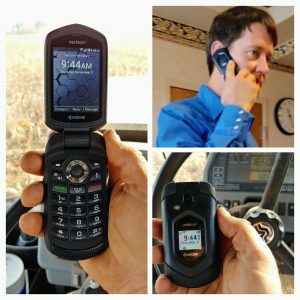 Perhaps you’re looking for a work phone that has restrictions on the abilities of a mobile device. Perhaps you’re looking for a phone for a child who isn’t yet ready for a true smartphone. Perhaps you’re wanting a simple device to handle calls and serve internet to other devices. Maybe you just want a small, rugged phone that excels at making calls. For all of these cases, the DuraXV LTE makes an excellent choice. Here is a video and some pictures taken with the DuraXV LTE as well as additional angles of the phone itself. 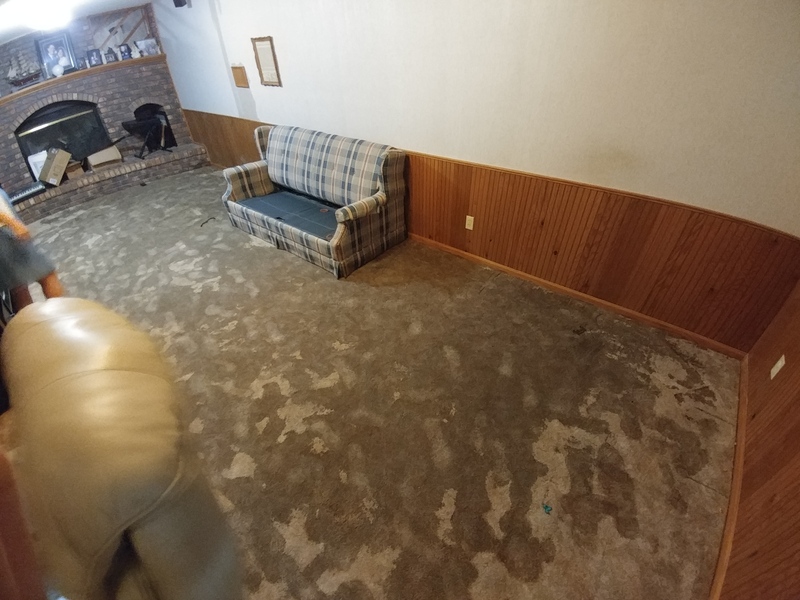 We sure went from getting-stuck wet to can’t-get-the-drill-in dry in a very short time. Finished wheat harvest on Friday. The combine was a champion this year… couple belts and hoses but no major problems…ran last 30 hours without a care in the world. 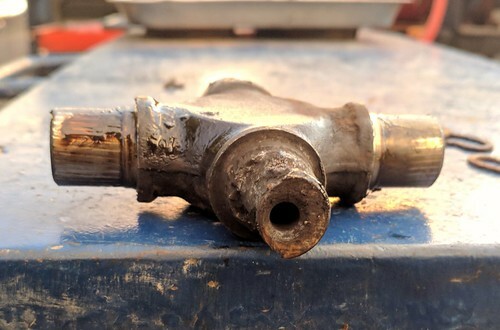 The drill had a bushing freeze up on a row unit Saturday just as I was getting ready to start drilling soybeans. Cost me the whole day and a smashed thumb. I’m hoping my fingernail gets malformed so I can carry on the family tradition started by my grandfather of telling each grandchild a different tall tale about why it’s that way. Yesterday I got in the cab and got a call from home that a pipe had burst in our basement. I took care of that and got 18 acres drilled yesterday before a tractor hose burst. My tractor never breaks down. It seems phones are all about gimmicks these days, and there’s nothing wrong with that. The Moto Z has Moto Mods. Samsung has been putting curved screens on its phones like the Galaxy S6 Edge+ and now the Galaxy S8. 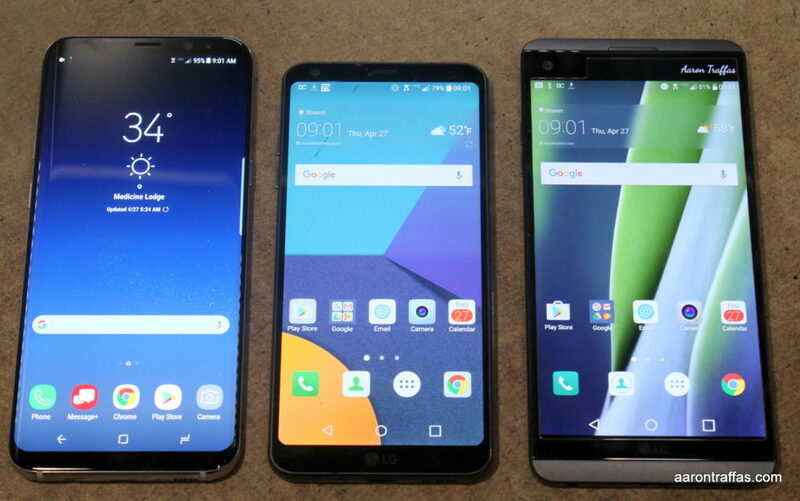 LG’s G5 has Friends and LG’s V10 and V20 have a second screen. In a world where every phone has a gimmick, sometimes you just want a simple phone that executes perfectly on the fundamentals. My friends at Verizon let me spend a few weeks with the LG G6 and I’m convinced that’s exactly what it does. 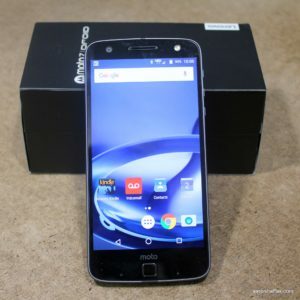 It’s a fast, straightforward phone with a large, single, flat screen and excellent cameras. And I love it. 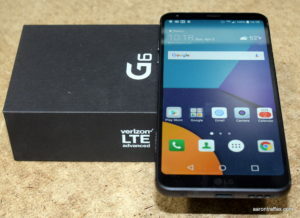 The G6 has the same large 5.7″ screen as the V20, which is significantly larger than the G5. However, the G6 packs this extra screen into a body that’s actually slightly narrower and shorter than the G6. It does this by nearly eliminating the bezel — the plastic border between the screen and the edge of the phone — as well as making the screen taller than normal. The phone is extremely fast and I never found it to lag. It comes in 32 GB and 64 GB versions and thankfully supports SD card external storage for those of us with ridiculous amounts of podcasts. The power button doubles as a fingerprint reader and is located in a great spot on the back below the camera. Volume buttons are on the left side. The speaker is on the bottom next to the USB Type-C port and the headphone jack is on the top. The battery is 3300 mAh and it’s not removable. 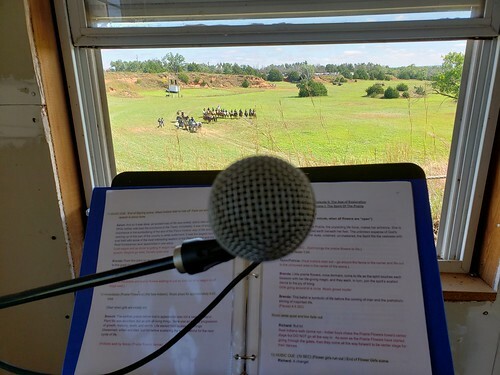 In my real world usage, playing podcasts all day with Bluetooth, it lasted me from 8 a.m. to 5 p.m. That’s great for someone with a desk job. On the farm that means I’d have to look for a charger in the middle of the day. LG has done a great job with fast charging, and I’m excited that they brought back wireless charging that was sorely missing on the G5 and V20. I do wish they’d have given the G6 the removable back and upgradable battery that made the G3, G4, V10 and V20 so wonderful. The bezel reduction makes the phone somewhat more difficult to type on. Indeed, I found it almost challenging to use without a case. I grabbed an Oeago case from Amazon. While it doesn’t have a belt clip, it makes the G6 much easier to hold and use and, for under $6, is quite a bargain. The G6 has the same dual camera configuration that was found on the G5 and V20 — a standard lens next to a wide-angle lens. Where the V20 had a 16 MP primary sensor and an 8 MP wide-angle sensor, the G6 has 13 MP sensors for both the standard and wide-angle lenses. I’m a huge fan of the wide-angle pictures, so the big jump from 8 MP to 13 MP is something I really like. 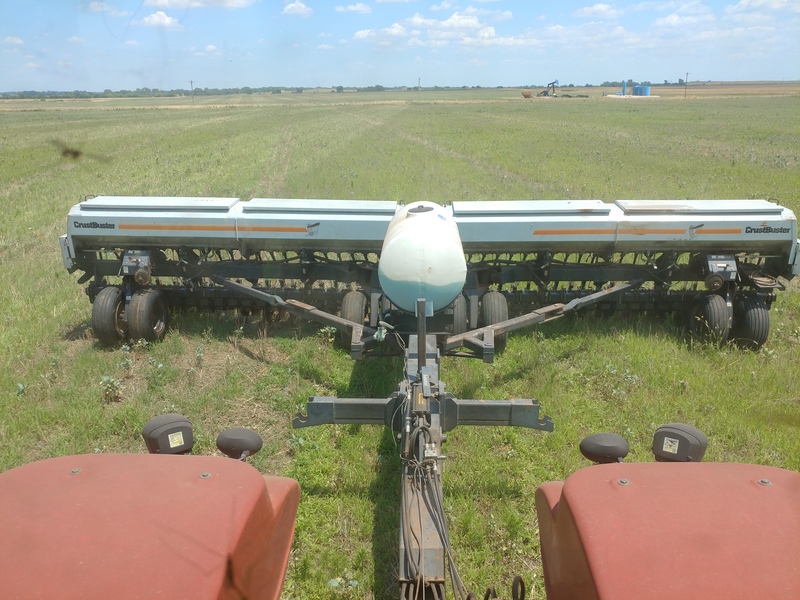 Here’s a comparison set showing pictures of canola with the standard lens and wide-angle lens. While the standard lens resolution is lower with the G6, the picture quality is as good or better than the V20. Here’s a comparisons of an inside shot in uneven low light between the V20, G6 and the Samsung Galaxy S8+. Here’s another comparison of the three phones taken outside. All photos are unedited. The resolution is set to high. HDR and flash are set to auto to simulate common real-world point-and-shoot phone photography. LG keeps getting better with their software. The G6 has the usual pre-installed bloat that comprises some games and Verizon apps, but those can be easily uninstalled or disabled. The additions to Android aren’t nearly as obnoxious as they were in previous phones and the experience feels fast and clean. I especially like the design of the in-call screen, which feels more modern than previous LG versions. The only feature missing that would make the G6 the perfect phone is a removable battery. It ticks every other box — beautiful, large, flat, IPS screen; SD card expansion slot; fast processor with enough memory to remain snappy for years to come; and the wonderful wide-angle secondary camera. I admit that I have a soft spot for LG phones. I carried the G3 for three years until this January when I upgraded to the V20. Last year, I bought my wife the G5 before I even sent my review G5 back to Verizon. LG makes terrific phones and the G6 is no exception. Instead of trying to find a new gimmick, the G6 simply executes on the goal to build a high quality, straightforward smartphone. As always, here’s a collection of unedited photos taken with the LG G6. In spring 2016, LG announced the G5, which was the first consumer phone that featured a modular design. You could remove the battery and plug in a camera enhancement or an audio system upgrade. The G5 was a great phone, but the add-on ecosystem never really took off. Last summer, Lenovo announced its take on the modular smartphone with the Moto Z. My friends at Verizon recently let me spend a couple weeks with a Moto Z Force Droid — and a few Mods — and I’m convinced that Lenovo’s approach to add-ons is the right one. The Moto Z Force Droid Edition isn’t the fastest or biggest phone on the market, but it’s not far from the top. It has a relatively large 3500 mAh battery supporting the sizable 5.5″ ShatterShield screen that’s guaranteed not to crack. The phone only comes in a 32 GB version, which isn’t enough for podcast addicts like me, but it does have a micro SD card slot so that storage isn’t a concern. The camera is nice, too, at 21 MP with optical image stabilization and laser autofocus. I especially like the low light performance. The power and volume buttons are on the right side of the phone. There’s a fingerprint reader below the screen on what seems to be a needlessly large lower bezel. 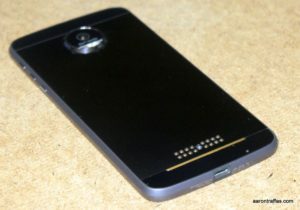 I’d prefer a fingerprint reader on the back, but considering the interchangeable backs of the Moto Z, it’s understandable that they had to put it below the screen. The biggest problem I had with the hardware is the lack of a headphone jack. When I heard the Moto Z was the first phone to ditch the traditional 3.5 mm audio plug, I didn’t think it’d be a problem since I nearly always wear a Bluetooth headset. 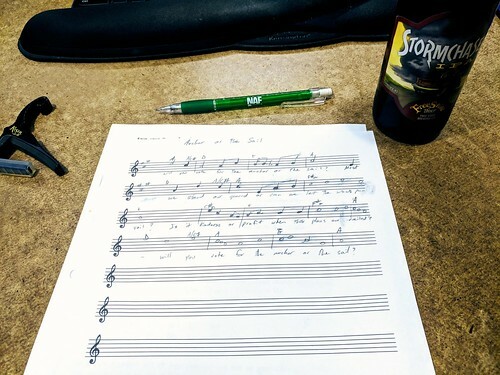 However, I needed the headphone jack three times in the two weeks I carried the Moto Z Force — once when my headset battery ran out and I didn’t have a spare, once when I was wanting to play music through the PA system before an auction and once when I was using the projector to display a basketball game and I wanted to play the audio through my sound system. While there’s a USB Type-C headphone jack adapter in the box, I’m not going to carry it around in my pocket when I may only need it once or twice a week. The software on the Moto Z is very similar to the Moto X and Droid Turbo. There are a lot of Verizon apps preinstalled, but the actual Android experience is about as close to stock as you can find without buying a Nexus or Pixel phone. Motorola is really good about only adding beneficial enhancements and otherwise leaving Android alone. All these things considered, the Moto Z Force Droid is a solid flagship release. What makes it shine, though, is the implementation of Moto Mods. These attachments have strong magnets that snap to the back and connect through a number of pins. There are several currently available, and Verizon sent me a battery, camera and projector to try. While the 3500 mAh battery might get an average user through a day, on my farm my experience has shown me that it’ll last me until about 3 p.m. I hate trying to find a charger in the middle of the day, so I won’t carry a phone without the ability to add additional battery capacity. Most phones have done away with upgradable batteries, so the only option for most phones is a clunky battery case. 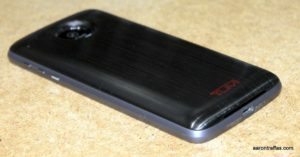 The TUMI Wireless Charging Power Pack Moto Mod provides an additional 2200 mAh and also supports wireless charging. It can be used to keep the phone battery at 100% as long as possible, or used in Efficiency Mode which keeps the phone battery at 80% for as long as it can. Unlike battery cases, it looks like part of the phone. Worrying about the level of charge for two separate batteries isn’t quite as convenient as a single battery upgrade on a phone with a replaceable battery, but if I was going to own a Moto Z Force, I’d definitely get one or two of these Mods to get myself through the day. The 21 MP shooter on the Moto Z Force itself is pretty good. However, like cameras on most smartphones, it lacks optical zoom and even basic hardware camera controls. The Hasselblad True Zoom Camera Mod features a real 10x optical zoom, bright xenon flash and physical buttons for the power, shutter and zoom. The sensor is only 12 MP, though, and while it works great in sunlight I found it tough to keep in focus at 10x zoom on an overcast day. For shots that don’t need zoom, I got much better pictures by pulling the Mod off and using the camera on the phone. While the battery Mod is essentially crucial for day-to-day use and the camera Mod has a very specific utility that could be extremely valuable for certain use cases, the Motorola Insta-Share Projector Moto Mod is either really fun or really important for business. I thought it was a gimmick, but the first night I had it I found myself using it at a meeting after someone literally said “…if we only had a projector.” It’s extremely easy to use, with just a power button and a focus wheel. I really wish it had a headphone jack so I could have played the audio over my PA at the bar while I was watching the KU basketball game before my show. The battery lasted only through about the first half of the game, even though I had the phone plugged in to a fast charger. Even so, I can see how great this projector would be to show video clips to a group of friends or pitch a presentation at a board meeting. In summary, the Moto Z Force Droid Edition is a very solid flagship phone that has a killer feature — an open ecosystem of modular add-ons that adds real functionality to an already premium smartphone. Here’s a picture comparison taken of some canola with various cameras. Here are a few pictures taken with the Moto Z Force Droid and some with the Hasselblad Mod. First picture with Moto Z Force – lunch time! 136 queries in 3.716 seconds.